Eglu owners Hattie, Daisy, Eva and Isobel must be some of the luckiest girls we know. 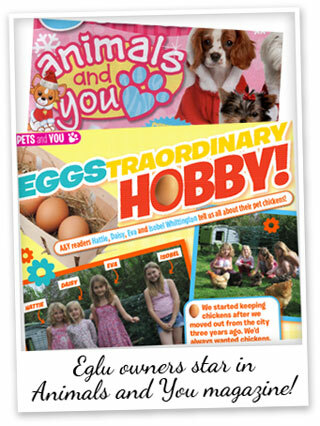 Not only do they have pet chickens in a Cube, guinea pigs in an Eglu and thousands of bees in a Beehaus, but they have just made their first star appearance in kids magazine ‘Animals and You’. The Whittington sisters have featured in the latest issue of the magazine because of their eggstraordinary hobby of keeping chickens. The girls had some brilliant things to say about their pets, including “they’re soooo friendly, they follow us around the garden all day and sit by the back door at tea time in case there are any leftovers”. And they had good things to say about the Eglu too: “They come in really cool colours and are easy to keep clean and fox-proof!” Thanks girls! Chicken keeping really is fun for all the family, so if you are thinking of making 2013 the year to start a new hobby, check out our chicken keeping guide for lots of great advice!